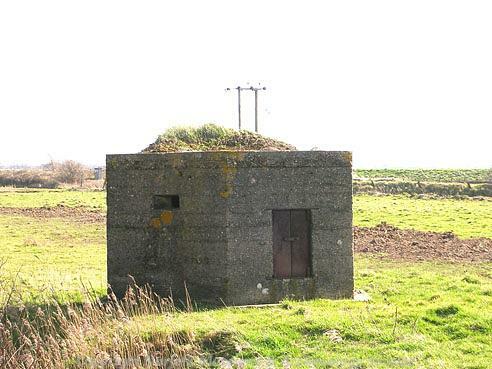 A World War One polygonal pillbox still stands just to the south of New Road, Great Yarmouth (the A47). It has been visited on the ground and is also visible on aerial photographs. It is one of two such pillboxes (the other is recorded as NHER 18493) which lie on either side of the road and were presumably sited to control access along it. November 1982. Visit. South side Acle New Road. Formerly part of Reedham Parish. Pill box, polygonal, concrete, part of camouflage mound remains on top. D. Gurney (NLA) 17 November 1996. NMP mapping has led to the alteration of the central grid reference of the site from TG 5051 0890 to TG 5062 0891. The World War One polygonal pillbox described above is visible as an extant structure on aerial photographs, e.g. (S4). The camouflaging mound of earth on its roof is also visible but has not been mapped by the NMP. It may have been reused during World War Two but there is no clear evidence of this on the consulted aerial photographs, e.g. (S5). <S1> Article in serial: Bird, S.. 1991. The Fixed Defences of North and East Norfolk in the Two World Wars.. NIAS Journal. Vol 5 (No 1), pp 3-34. <S3> Photograph: 1995. RDS 17. 505089. World War One pillbox..
<S4> Vertical Aerial Photograph: Ordnance Survey. 1989. OS/89047 330-1 18-MAR-1989 (NMR). <S5> Vertical Aerial Photograph: RAF. 1944. RAF 106G/LA/21 4034-5 04-JUL-1944 (NMR).